Lionel Messi will make his 600th official appearance for FC Barcelona when they host Sevilla at the Camp Nou Stadium on Saturday. Only Xavi Hernandez (767) and Andres Iniesta (642) have played more games for Barca than the 30-year-old who made his debut on October 16, 2004. And nobody has got close to the 523 goals he has scored for the club, who currently lead the Liga Santander with a four point gap over Valencia. As many as 23 of those goals have come against Sevilla in 21 league games against the side from the south of Spain. With the form Messi is in, it would almost be a surprise if he didn't add to that total on Saturday night. Barca have not been at their best at times this season, as shown by their 0-0 draw away to Olympiakos in the Champions League on Tuesday or the slightly fortunate 2-0 win away to Athletic Club Bilbao last weekend. 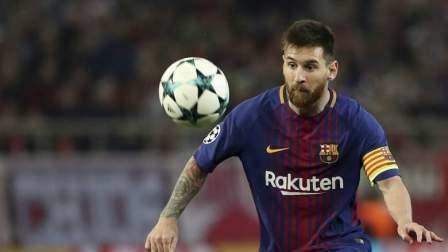 Messi and goalkeeper Marc Andre Ter Stegen were the architects of last weekend's win with Messi opening the scoring and Ter Stegen frustrating all of their rival's efforts. Meanwhile, Barca are still without the injured Dembele while Luis Suarez is struggling for form in front of goal, limiting Barca coach Ernesto Valverde's options in attack, given that he appears to have little faith in former Valencia forward Paco Alcacer. Sergio Busquets and Ivan Rakitic will play in midfield. Valverde has injury issues and Rafinha is still sidelined along with Andre Gomes, Arda Turan and Sergi Roberto and Inesta doubtful until the last minute. Sergi Roberto's injury means Nelson Semedo will play at right back while Denis Suarez could also appear against his former club. Sevilla have won their last three games to end a mini-crisis, but the last of those was only on Wednesday night in the Champions League, meaning they have had little time to recover before visiting a ground where they have lost on nine of their last 10 visits.